Who will win? Thomas Jefferson or John Adams? 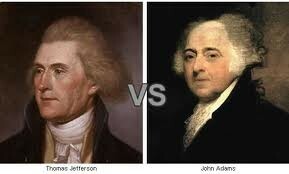 I hope that Thomas Jefferson wins. Why? Because he would help France out in there war if they have one. They helped us in a time of need, so we should payback for what they did for us. He is right about having a loss military and we should fear if we have one. They might become to powerful and we will become another British country. Who wants that?. The last thing that is great about Thomas Jefferson is that he believes in states right. If we didn't have states right then the government in Washington would take over and again could possibly take over and be a British structure country. This is my opinion about the debate.